In this project, we are going to develop a PIR sensor and GSM based home security system. 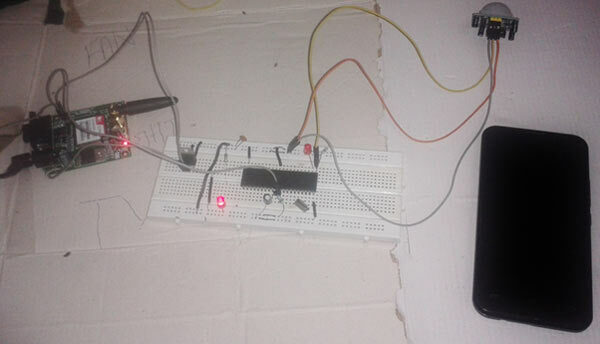 This project is developed using 8051 microcontroller. It can be used to detect any intrusion in houses and offices and send the alerts on cell phones. Let us know how to develop this system, step by step. PIR sensors are used to detect living being movement. PIR is a Passive Infrared sensor, which detect infrared rays. All living being with a temperature above absolute zero emits heat energy in the form of radiation. These radiation are infrared ray. Human eye cannot see these rays because these rays are radiated at infrared wavelength. When any living being comes in range of PIR sensor, it detects heat of that living being and generate an output. PIR sensor module does not send any rays for detection, its only detects heat (Infrared). You can know more about PIR sensor in PIR sensor circuit. The SIM900 is a complete Quad-band GSM/GPRS Module which delivers GSM/GPRS 850/900/1800/1900MHz performance for voice, SMS and Data with low power consumption. Ctrl+Z - send message command (26 in decimal). In this project we have used 8051 microcontroller for controlling the whole process of the project. A PIR sensor is used for sensing human presence. And when PIR sensor sense any movement in targeted area of room then it gives a HIGH logic to microcontroller and then Microcontroller take place and make a call via GSM module using AT commands. Controller calls to a predefined mobile number and at the same time it also sends a message to the same number via GSM Module. Circuit connections are shown in the above circuit diagram. GSM module’s Rx and Tx pins are directly connected to Tx and Rx pin of microcontroller And supply by using a 12 Volt adaptor. A PIR Sensor module’s Dout pin is directly connected at pin 21 (P2^0) of Microcontroller with a 10K pull up resistor. A 11.0592 MHz Crystal oscillator is used in this circuit for generating clock signal for microcontroller. And a 5 volt voltage regulator is used for provide 5 volt for the whole circuit. In programming, first of all we include header file and defines input and output pin and variables. Here we have some function that we have used in our program. In this we have configure 9600bps baud rate at 11.0592MHz Crystal Frequency, and function for receiving. We are monitoring the SBUF register for receiving data. After this in main program we have initialized UART and then we read the output of PIR sensor module. And if sensor gives HIGH logic to controller then microcontroller make a call with sending a message at the same time by using AT commands. Can I use 5v battery instead of 7805 .
i am planning to do this as my project...will it work out if i follow all the instructions here ...? and also i have only 1 mnth time,is it enough?? Yes you can make it. it will work fine. and you time period is good enough for completing this project. Can i use more than one sensor in this project?what changes will have to be done if i use more than one sensor? you can use this code for two sensor..
0 1 mikroc8051.exe -MSF -DBG -pAT89C51 -ES -DL -O11111114 -fo8 -N"C:\Users\Enoch\Documents\Mikroelektronika\Security system with PIR\Security System PIR.mcp51" -SP"C:\Users\Public\Documents\Mikroelektronika\mikroC PRO for 8051\defs\" -SP"C:\Users\Public\Documents\Mikroelektronika\mikroC PRO for 8051\Uses\ATMEL\" -SP"C:\Users\Enoch\Documents\Mikroelektronika\Security system with PIR\" "Security System PIR.c" "__Lib_Math.mcl" "__Lib_MathDouble.mcl" "__Lib_System.mcl" "__Lib_Delays.mcl" "__Lib_UART_Timer1.mcl" "__Lib_CType.mcl" "__Lib_CString.mcl" "__Lib_CStdlib.mcl" "__Lib_CMath.mcl" "__Lib_Conversions.mcl" "__Lib_Sprintf.mcl" "__Lib_PrintOut.mcl" "__Lib_Sprinti.mcl" "__Lib_Sprintl.mcl" "__Lib_Time.mcl" "__Lib_Trigonometry.mcl" "__Lib_Button.mcl" "__Lib_Keypad4x4.mcl" "__Lib_Manchester.mcl" "__Lib_OneWire.mcl" "__Lib_PS2.mcl" "__Lib_Sound.mcl" "__Lib_SoftI2C.mcl" "__Lib_SoftSPI.mcl" "__Lib_SoftUART.mcl" "__Lib_GlcdFonts.mcl" "__Lib_Glcd.mcl" "__Lib_LcdConsts.mcl" "__Lib_Lcd.mcl" "__Lib_RS485.mcl" "__Lib_T6963C.mcl"
saddam your code giving error in this line #include<reg51.h> how can i right it? please,can i get code by using 8051? thank you. It is already developed using 8051, please read carefully. sir, I am going to do a project almost the same as this one. I want to do the simulation in Proteus please send me the full proteus circuit diagram and the code by my email address. Hello sir, can i remove the GSM module instead attach a fan with turns on & off on human detection. kindly provide the code changes requirment for this.Thank you. I want to make a security system that's have 2 pir motion sensor, one alarm , and its send massage and call to three mobile numbers. Kindly upload source code for this project. Which compiler to be used to generate hex code. Keil compiler is used to generate the Hex code. Check our 8051 section. I need little help on coding as the current one is giving a little problem. When there is movement the PIR gives output which makes microcontroller sends signal to GSM module to send SMS. Problem : it continously send SMS when there is continous movement after some delay!!!! I would like the coding to send sms when there is first time movement and then it should stop sending sms even when there is continous High signal from PIR. It should again send SMS when PIR stops and then again send high signal. Hope I have been clear on the above!!!. Waiting for the results from great programmer here. I made the circuit according to the circuit diagram and I just checked and found that even without PIR the Microcontroller is sending SMS throgh GSM???? I followed as per circuit diagram. Any thing to addup which I missed??? Further please check my other request where I need coding to send SMS only at input trigger. You need to understand about the PIR sensor, please check this article about PIR sensor. First you need to reduce the sensitivity of PIR by using the Distance control knob and then you need to configure PIR in Non Repeatable Triggering Mode and set some time Time delay in PIR using Time Delay knob, to prevent sending repeated SMS. Also set some delay in 8051 Coding. a major problem is that when i am removing the pir sensor from the circuit still the microcontroller is sending high op to gsm and sms is comming to my no where is the error ?is there anything in coading is wrong ? I want C programming of pir and GSM based home security system using AVR(atmega16). The microcontroller in your instructible is quite different from the one in the circuit diagram. Why is that so????? ?....… why talk about 8051 and then you use AT8......????? AT89C51 is a 8051 microcontorller. i ca't verify this code #include<reg51.h>. can you give me link 8051 library to add in arduino library?? Which Software can i simulate this code ? You can use Proteus to simulate the code, you may also need to install GSM library in Proteus for GSM module. HOW I CAN GET THE BURNER? ARE U SOLD THE BURNER? CAN I BUY WITH YOU? i got this message..how i want to solve this problem? what code must added? This is a very nice demonstration , congratulations on that part . I am doing a college project that requires me to do the same thing as you have done but using mspp430 mc instead of 8051 . so can you please send me any instruction/changes/modification regarding the same ? My email id is -  , you can contact me there . Thanks in advance. Sir, can i implement this one with home automation (already you given seperately) both of them how to implemented with single ardunio and single gsm module..? And then what would be change in program? Sir pls i want to ,gsm based home security and applience control both,h ence control and security both in this project qhat changes can i do ? sir...., what is the need of crystal in the circuit?? i select this project to my assignment. so i want to know program will work ? can i use buzzer instead of gsm module? yes you can.. but why? Is the code be changed if i use SIM800L GSM module? and can you provide me a tutorial to how to connect adapter to SIM800L? hello sir, I followed this circuit diagram and code exactly same as shown at this site but still there is no output. what to do? is the given circuit diagram and code is correct? what if i want to use a PSoC with the PIR Sensor and GSM Module Based Home Security System? Please help me, how to burn microcontroller ?